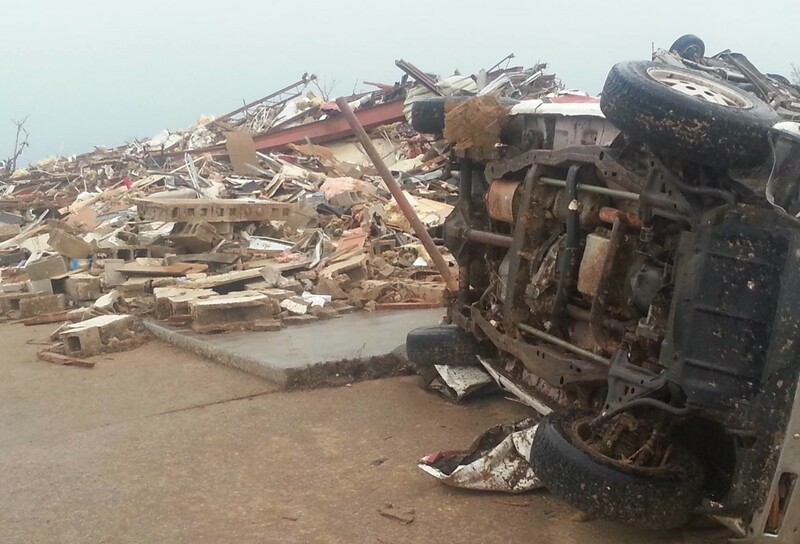 As a massive tornado bore down on Moore on the afternoon of May 20, 2013, residents scrambled to find shelter. Some retreated to safe rooms at home or in buildings. Many hid in closets, bathrooms or hallways. Meanwhile, in Stillwater, people were also on alert because a tornado watch had been issued that day. But the city received only a light rain and no wind damage, according to the National Weather Service. The destruction and deaths caused by the Moore tornado led many people in the city to believe that a residential storm shelter was essential. But after the May 20 tornado, when the federal government began approving cash aid for projects like residential shelters to prevent the future loss of life and property, Moore was shut out of the program, according to data analyzed by Oklahoma Watch in a joint project with KGOU Radio. Stillwater, on the other hand, has so far gotten the largest share of federal “hazard mitigation” funds released under the presidential disaster declaration, records show. Stillwater will spend about $1.9 million, most of it federal money, to help pay for more than 700 safe rooms in residents’ homes. The same program will allow Oklahoma State University there to spend $73,000 to install a lightning detection and warning system, needed partly for sporting events. Moore has not been left out in the cold. The city is using a $3.8 million donation from the American Red Cross to fund rebates for 1,500 new residential storm shelters. Moore also plans to spend federal community block grant money on private storm shelters in homes. It is using other disaster aid, insurance and donations to rebuild two destroyed schools that will have safe rooms. But Moore, as well as Norman, were not able to tap hazard-mitigation grants right away for several reasons – mainly because obtaining the aid requires having an approved hazard-mitigation plan, and the plan that Moore and Norman were relying on, Cleveland County’s multi-jurisdictional one, had expired. Several other counties in the declared disaster area, including Seminole, Okmulgee and Pottawatomie, also did not have hazard mitigation plans. Cleveland County’s hazard mitigation plan expired in late 2011, and it wasn’t until a few months ago that the Federal Emergency Management Agency approved the county’s new multi-jurisdictional hazard-mitigation plan. Such plans identify disaster risks and vulnerabilities and outline strategies to prevent loss of life and reduce damage. Most of the time, a disaster has to occur for FEMA to make hazard-mitigation program funds available. That was the case after tornadoes and storms struck 21 Oklahoma counties between May 18 and June 2, 2013, which was officially designated as “Disaster 4117” by FEMA. The hazard-mitigation money provided by FEMA is calculated by taking 15 percent of the total amount spent on both individual and public assistance aid related to the disaster. So far, it appears that at least $8.7 million in federal hazard-mitigation funds will be made available in the state. By early June, more than $3.5 million had been approved for 21 mitigation projects in 14 counties around Oklahoma. According to state records, more than 70 additional projects from counties, school districts and cities are awaiting approval and are seeking a total of more than $25 million in federal funding. FEMA administers the program, but the state works with local entities on submitting applications, selects the winners and lines them up in order of priority. All plans must meet federal requirements. Federal funds cover up to 75 percent of the cost, with local entities paying the rest. Albert Ashwood, director of Oklahoma Department of Emergency Management, said even when localities’ applications are finalized, federal funds may not be available at the time. In that case, the projects remain queued up and can quickly be submitted for funds in the event of a disaster. The projects can be funded regardless of whether they are located in the declared disaster area, he said. The Stillwater storm-shelter rebate program was one of those. In 2011, Stillwater polled residents on their interest in applying for a storm-shelter rebate program, and more than 700 property owners who responded were identified as eligible, said Valerie Silvers, grant coordinator for the city. Estimated total cost was about $1.9 million. The city submitted its application to Oklahoma Emergency Management. For two years, the program sat waiting. When the May 2013 tornadoes struck and FEMA hazard-mitigation aid began to be made available, Stillwater’s project was one of the first approved. Other projects approved include safe rooms in Oklahoma City, weather radios in Le Flore County and Clinton, sirens in Wister, and development of hazard-mitigation plans in other counties. To apply for mitigation funds, a jurisdiction must have a hazard mitigation plan, which can be funded by FEMA and must be renewed every five years. The plan can cover one or more jurisdictions. In early 2011, Cleveland County began work on renewing its plan, which was set to expire later that year, according to several officials in Cleveland County. On average, it takes 18 to 24 months to develop a hazard mitigation plan and another six to 12 months to gain approval, said Cain, of Oklahoma Emergency Management. The agency recommends allowing three years. Among Oklahoma’s 77 counties, 32, or 42 percent, have expired hazard-mitigation plans or never had a plan, emergency-management data show. Cleveland County’s updated plan went to the state for review in August 2012, after its earlier plan had expired. But the new plan was returned for revisions in November 2012, Cain said. Approval would not come until April 25 this year. One reason for the three-year delay was that while Cleveland County and other jurisdictions covered by its plan were revising the document, FEMA introduced a new “Local Mitigation Planning Tool” that required a much greater level of detail for each jurisdiction within a county, Cain said. George Mauldin, the county’s emergency management director, did not return calls. The delay rippled out to communities. Before the county’s plan expired in 2011, Norman had submitted an application for a storm-shelter rebate program, Grizzle said. The program would have offered a rebate of up to $2,500 for 450 storm shelters at a projected cost of $1.1 million. By the time the application was submitted, about 1,300 Norman residents had signed up, Grizzle said. However, because Norman was included in Cleveland County’s hazard mitigation plan, when the county’s plan expired, Norman’s application became ineligible. When the tornado struck in Cleveland County in May 2013, the normal requirements of submitting the county’s plan to OEM were waived and the plan was submitted directly to FEMA, Cain and Grizzle said. After numerous revisions, the Cleveland County plan was approved by FEMA in April. Grizzle said he is in the process of updating Norman’s application and updating the list of applicants. Many have moved, died or bought shelters on their own, so the list has dropped to about 600 and more will not be added. The application should be re-submitted to the state by the end of July and within five months be approved, he said. “I’ve been verbally assured (by OEM) it would be funded,” Grizzle said, although nothing is guaranteed. As for Moore, it had begun work in 2011 to submit a storm-shelter rebate project to the state and FEMA, but after the county’s hazard-mitigation plan expired, it did not submit the application. Cleveland County also was working on its own storm-shelter rebate program and had sent out cards notifying some applicants that they had been selected and could participate if the funds came through, said Kitch, the Moore emergency director. “There’s a lot of people who still have those postcards who say, ‘I was selected by the county. Why didn’t I get a shelter?’ Well, the program never got off the ground,” Kitch said. Another sticking point was that Oklahoma City, part of which is in Cleveland County, had declined to be part of the county’s hazard-mitigation plan, said County Commissioner Rod Cleveland. Oklahoma City had its own FEMA-approved plan. When the spring 2013 storms occurred, Oklahoma City’s application for a storm-shelter rebate program was waiting in queue with the state, said Frank Barnes, Oklahoma City emergency manager. The city’s program was ninth in line, but shot to the top because it had a mitigation plan in place, the application was good, and the city was directly affected by the disaster, Barnes said. The roughly $1.3 million in federal and local funds will pay for storm-shelter rebates for an estimated 504 homeowners. “Five hundred four safe rooms in a city our size is not much, but it’s a good start,” Barnes said. Demand for storm shelters in homes has soared since the disaster, but even Moore won’t necessarily go full tilt to meet the demand using hazard-mitigation funds. Since the tornado, Moore has issued about 3,000 permits for new storm shelters, which is more than twice the number of shelters registered with the city before the tornado, said Kitch and Elizabeth Jones, community development director for the city. Moore plans to use the American Red Cross donation to offer rebates on 1,500 new storm shelters in a lottery, and about 4,600 people initially signed up, Kitch said. Kitch said it’s not clear at this point whether the city will submit an application for FEMA hazard-mitigation funds for another rebate program. The city will assess the needs. It’s possible that Moore will not get any of the hazard-mitigation funds made available as a result of last year’s disaster, he said. KGOU Radio has aired stories on Disaster 4117 on Monday, with Kate Carlton Greer reporting as part of The Oklahoma Tornado Project. The data team for Investigative Reporters and Editors and the Investigative News Network assisted with the project. Auditing the Storm: More than half of the federal relief funds tied to Disaster 4117 are in the form of community grants. But there are conditions and deadlines, and residents may have opinions on how to spend the money.